For telephone handset. Color: Black. RJ22 (4P4C) to RJ22 (4P4C). Cord length: 12 feet (3.8m). Coiled length: 25 inch (63cm). Endures repeated use; included extending of the phone cord. For telephone handset. Color: Black. RJ22 (4P4C) to RJ22 (4P4C). Cord length: 25 feet. Coiled length: 25 inch (63cm). Endures repeated use; included extending of the phone cord. If you require any kind of telephone categories, you can search them at SF Cable. We have coiled handset cords for your telephone as well. All items are reachable to you with the help of a few clicks. 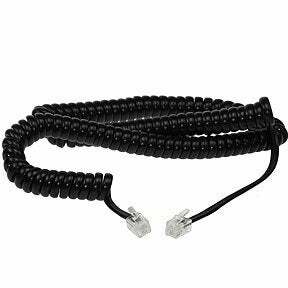 In this category you can find coiled handset cords in different lengths which endure repeated usage and includes the extending of the phone cord. You can get it in different colors as well. All products at SF Cable are approved for quality by ISO 9001-2000 and are sourced from registered manufacturers. Moreover, all products are RoHS compliant and cause no harm to the environment.